My initial interest in King’s latest book stemmed from an interview that the author gave on CBC’s radio show Q with Jian Ghomeshi. Ghomeshi raved about the book, and I, having just plodded through the cumbersome tundra of Michael Chabon’s The Yiddish Policemen’s Union, was more than happy to read something I assumed would be plot-driven. I spotted King’s book at a Coles in London, Ontario, and must have said, “Oh, I’ve been meaning to buy that!” a little too loudly, because my reaction visibly startled a nearby teenage girl who was leafing through a copy of The Hunger Games. In short, Chabon's obsession with controlling his language and piling up unnecessary details makes it very difficult for a reader to keep track of the text’s overall arc. The reader doesn’t so much enjoy Chabon’s talent as capitulate to it. The pleasure to be gained from his text stems from admiration more than participation. King, on the other hand, presents only what is crucial to his characters, setting, plot, etc - no small feat for a book over 800 pages in length. This brings me to a point I’d like to make about the particular pleasure that comes with reading a long novel like King’s. The readers of 18th and 19th century Britain probably knew this pleasure well, but it might not be accessible to as many people nowadays, at least not in its textual form. The most common modern-day equivalent of this long-narrative pleasure, I think, can be found in the genre of premier television that has become associated with HBO. It is a particular enjoyment that comes from an arc that has enough time to wander. In textual form, Jonathan Franzen’s The Corrections provides this sort of pleasure, as does Rohinton Mistry’s A Fine Balance. The same wandering that makes shorter stories insufferable is exactly what keeps the long narrative fresh and interesting. What matters is that the story continues to develop without becoming repetitive, and that it has a clear knowledge of where it is going (hence the importance of rewriting versus editing). This long-arc pleasure can be summed up in one of the most interesting plot points of Stephen King’s new text: when the protagonist Jake Epping travels back in time to stop the 1963 Kennedy assassination, he returns to the year 1958, meaning that he must kill five years before his attempt to save Kennedy. The vast majority of the novel deals with how Jake spends these five years, and much of the action has only an implicit connection to the Kennedy assassination. In the fantasies of most readers, revisiting the past often involves returning to a particular night or event – a short trip. But King’s book captures just how uncanny it would be to return to the past on a long-term basis. That is not to say that Jake is trapped in the past; rather, he must willfully choose to spend half a decade knowing how major world events will play out...unless he intervenes. In the Q interview, Jian Ghomeshi made note of critics’ tendency not only to write off Stephen King as a pulp writer, but to mock his propensity toward extremely long works. King’s reply was that if he could keep his readers riveted for more than 600 pages, he would feel like he’d accomplished something more significant than occupying them for 200. A long novel builds up a residue in its reader’s mind by virtue of its sheer length, and when you turn the final page, this novel leaves something different than a shorter work does, no matter how densely the latter is written. The long novel has a different rhythm, one that goes up and down, perhaps with increasing speed toward its conclusion, as in King’s case. If you have not recently read a novel longer than 600 pages, I heavily recommend doing so. If the task seems intimidating or burdensome, I think King’s new book will provide the perfect introduction. I've yet to pick up 11/22/63, but I have recently rediscovered the joys of long books, mostly since I picked up a Kindle. I've found that the experience of reading on Kindle, which gives every book the same weight and feel in your hand, facilitates my ability to get lost in the text and 'live' there for a while. As for Chabon's novel, I can recognize what you point out as 'pleasure from admiration more than participation', but part-way into the novel that fell away for me, and all of that ornamentation became 'natural.' Admittedly, I read it immediately after running through three other Chabon novels, so I suppose I was already primed for the style. Anyway, I'll second the endorsement of the long novel. I've actually had the same experience with long novels and the kindle! I also find that part of what makes the long novel very accessible in kindle form is the progress bar and the fewer words per page, which can increase a book's "page-turner" qualities, since you're getting that positive reinforcement more often as you "turn" more virtual pages. Thank you very much for your comments, and I will definitely revisit my views on Chabon as I seek out more of his work. 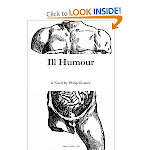 "The reader doesn't so much enjoy Chabon's talent as capitulate to it." Now there's a great phrase! I'd love to hear your take on texts that seem to want to cultivate readerly pleasure by being purposefully difficult -- Finnegan's Wake, say, or the poetry of Gerard Manley Hopkins. 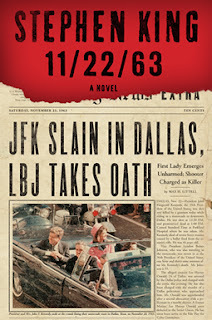 I think I'll add 11/22/63 to my summer reading list: it's been a long while since I last read King, and I miss the guy.